This book is also available for Excel 2019 and Excel 2019 for Mac. It provides a thorough (and easy to understand) coverage of Power Pivot, Power Query, and DAX. The January 2019 semi-annual update added Power Pivot to Excel 365 as a standard Excel feature. Unlike most other books, this book will teach you the relational database and data modeling skills needed to create optimal Power Pivot Star Schema data models incorporating DAX measures. You’ll conform to 24 best-practice Power Pivot rules, ensuring excellence in your future real-world data model designs. 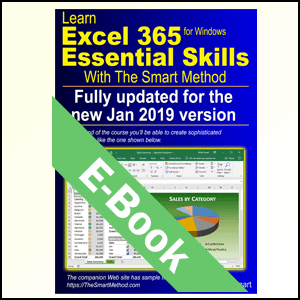 It covers the latest Excel 365 semi-annual version of Excel (January 2019). There are now two current Windows versions of Excel: Excel 2019 (the pay-once version) and Excel 365 (the subscription version that has more features). The editions are very different. A new Excel 365 semi-annual update is released every six months (in January and July) that adds (or removes) features and often changes the user interface. This is the only book that has a new edition published twice a year (to match the new Excel version). This means that the screen grabs will exactly match what you see on your screen and that any new features are covered. 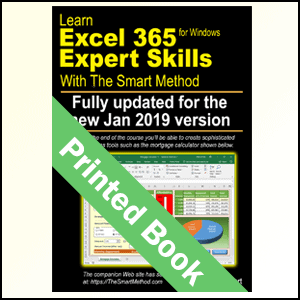 It can be very frustrating to attempt to learn Excel 365 using an out-of-date (or Excel 2019) book. It won’t waste your time by teaching basic Excel 365 skills that you already know.This isn’t a beginner’s book. If you are an absolute beginner, you need our Excel 365 Essential Skills book. By assuming that you are already able to use Excel’s basic features, far more ground can be covered. It teaches to true Expert level. 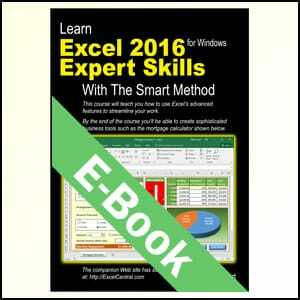 This Expert Skills book teaches Excel to an extremely high level of competence that is very rarely found in the workplace (even amongst top professionals). 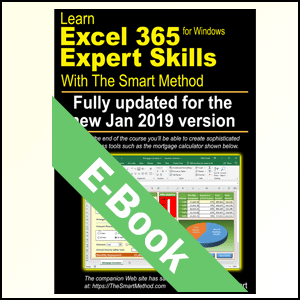 At Expert level your skills will be greater and broader than almost all other Excel users and you will understand (and be able to effectively use) absolutely every Excel and Power Pivot feature. You’ll have a complete mastery of skills that are often even a mystery to Excel power users. Learning success is guaranteed. For over fifteen years, Smart Method courses have been used by large corporations, government departments and the armed forces to train their employees. It is also the book of choice for teachers. The book is ideal for teaching or self-learning because it has been constantly refined (during hundreds of classroom courses) by observing which skills students find difficult to understand and then developing simpler and better ways of explaining them. This has made the book effective for students of all ages and abilities. Smart Method® books are #1 best sellers.Every paper printed Smart Method Excel book (and there have been ten of them starting with Excel 2007) has been an Amazon #1 best seller in it’s category. This provides you with the confidence that you are using a best-of-breed resource to learn Excel. The United States Army, Daimler Chrysler, Motorola, HSBC, Barclays, American Express, Allied Irish Banks, Imperial Tobacco, Volvo, BMW, Time Warner, Virgin, Pokerstars, Unilever, Deutsche Bank, The BBC, British Petroleum, The Foreign and Commonwealth Office, The Institute of Chartered Accountants, The Ministry of Defence, Keele University, HBOS, Transport For London, Scottish Power, BAE Systems, RBS, The British Museum, The National Gallery, Marks & Spencer, O2… and many, many others.